Enjoying a Pumpkin Spice Latte and a good read. The recovery is going well enough. I have staples in my heel that continuously rub against my splint which is very uncomfortable and the stitches are beginning to itch. Forget water boarding, I’m convinced that having an itch you cannot scratch is the worse kind of torture. The good news is that both staples and stitches come out this Tuesday and I’ll get the plaster cast put on. I have mixed feelings about this because while the case is much lighter and all-around more comfortable, it will be a completely hard casing around my leg and that doesn’t jive so well with my claustrophobia. The biggest struggle is still being house-bound and so dependent on others. I’ve been out for lunch once or twice and was like a kid in a candy store. It’s so exiting to fix your hair and put on make-up when your daily routine has been alternating between pajamas. Still I’ve been trying to stay put as much as I can tolerate while I’m still sporting the splint. My dad cannot believe that it’s been less than two weeks since the surgery and I’d rather a chair at Starbucks over my bed and television remote. Today has been a great day because my husband took the day off with sole purpose of getting me out of the house. 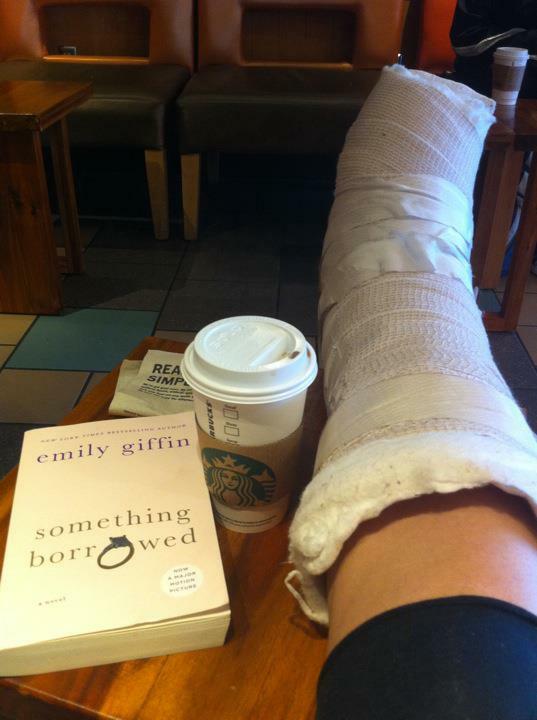 We went out for a fabulous lunch and I’m currently sitting in Starby’s reading Emily Giffin’s Something Borrowed and sipping a Pumpkin Spice Latte. Life seems normal at the moment. I’ve already struck up several conversations with strangers (my favorite thing ever) and I am an all around happy gal. Some of my friends are already making future plans with me that will keep my social life in tact (hopefully) and my outlook is very positive at the moment. May everyone who reads this do a little hop, skip and jump for me and take care.